Universally, the most flattering wash of jeans on all body types is dark wash jeans. WHY? Because any type of distressing, bleaching, fading, and/or whiskering on jeans will make objects appear bigger than they are…thicker, larger and wider. 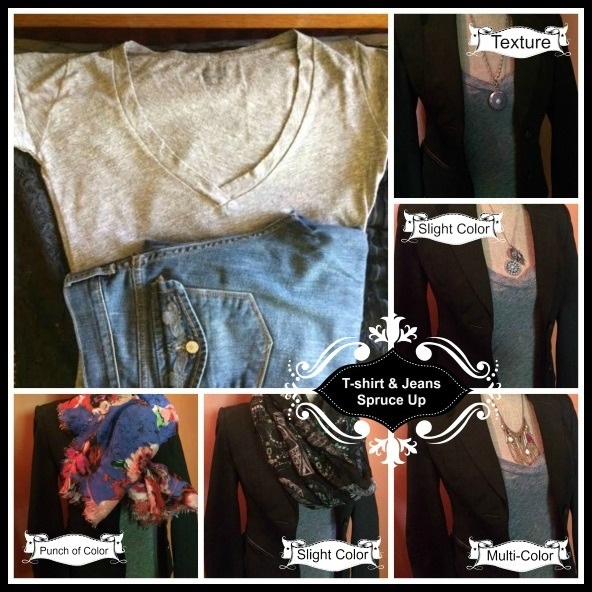 How do you take a simple t-shirt and jeans combo and turn it into an outfit? You add a more structured piece (blazer) and some form of color, texture or both. Don’t own a piece of jewelry or any scarves that will work? Don’t forget the power of shoes to add texture/color. Want to step out of your white/tan/black clothing comfort zone, but afraid to make a major change? Add some color with that impulse purchase scarf you’ve had hiding in a drawer for a few years now. 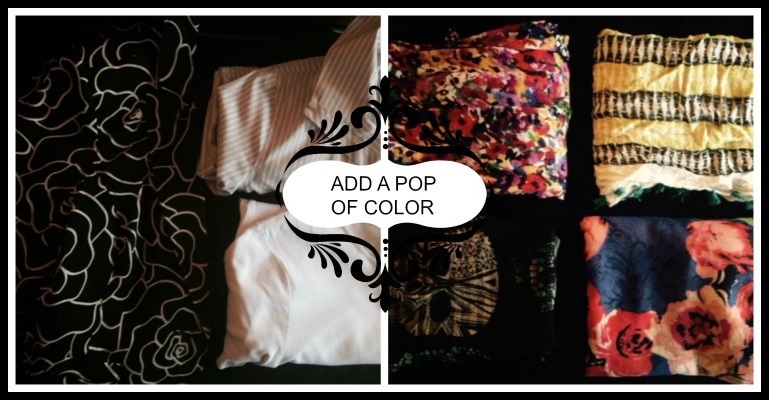 :) When you get comfortable enough with your scarf, CALL ME and I’ll show you how to add bolder pops of color. JB STYLING BITS – UNLAYERING – the art of dressing in unseasonably warm weather. Nothing like some beautiful sunny days like we’ve had lately to take away the winter blues, but what the heck do you wear?? Even though I store and switch out my clothes each season, I keep a few items from the previous season and the upcoming season. In other words, right now in my closet I have a few Fall blouses and Spring/Summer blouses. These are items that can be layered up for warmth in the Winter with jackets and scarves or worn alone on an unseasonably warm Winter day. Check out these examples!